Add some extra color to your table with this set of white and green wrappers. 210g total (2 kinds, 20 sheets each). 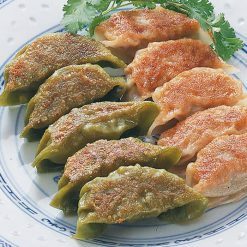 Gyoza, called jiaozi in China, are traditional dumplings. Many store-bought gyoza are stuffed with pork, green onions, and cabbage, and may come fried, deep-fried, or boiled. This set has both green wrappers made using spinach powder and white wrappers, allowing you to enjoy 2 different looks for your gyoza. 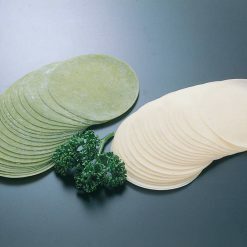 These gyoza wrappers are additive-free, and are made without using synthetic preservatives, quality-improving agents, or additives that are sometimes used in food products to prolong shelf life such as alcohol or vinegar. Making gyoza at home gives you the chance to fill, season, and cook them exactly as you wish! Whether you like your gyoza savory or spicy hot, soft or crispy, all the choices are in your hands. Since many pre-made gyoza contain meat, this is an especially useful option for vegetarians. Remove the outer bag, and defrost the wrappers in their inner bag in the refrigerator (about 3 hours). Before using the wrappers, remove them from the refrigerator and let them sit (still in their inner bag) at room temperature for a little while so that they will be easier to fold.Gyoza make great snacks, side dishes, or appetizers; and are delicious paired either with other traditional dishes or with modern fare. They can be eaten plain, or with soy sauce or other dipping sauces. This product contains white wrappers: wheat flour, starch (potato, tapioca), table salt, Green wrappers: wheat flour, starch (potato, tapioca), spinach powder, table salt..